There has been a political battle going on in Illinois over Immigration enforcement, specifically a program called Secure Communities. 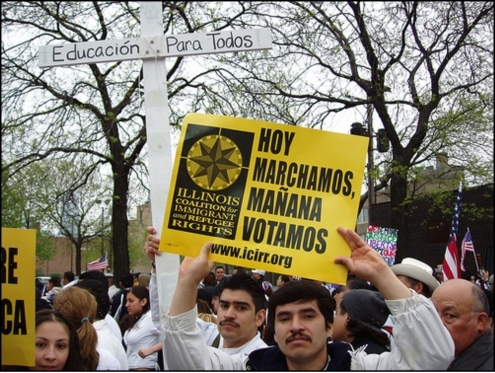 There is a Latino Activist group called Illinois Coalition for Immigrant and Refugee Riots (ICIRR) that has been leading the May Day marches and partnering with disgraced Governor Blagojevich in protecting the interests of illegal aliens. Their latest project is to work with county sheriffs to drop the Secure Communities program because (I am not making this up) it is deporting too many illegal aliens for minor crimes. 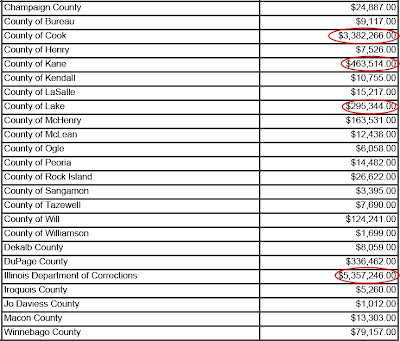 So far, Sheriff Pat Perez (Kane County) and Mark Curran (Lake County) have been vocal about dropping the program. Governor Pat Quinn has also notified ICE that the state police will no longer participate in the program. Not to be outdone, the Illinois General Assembly has been working on legislation that will hamstring ICE by creating additional paperwork and allow counties to opt-out of Secure Communities. Cook County and Chicago are not involved since they are already sanctuaries. So, if they don't want to participate, pull their funding. The State Criminal Alien Assistance Program (SCAAP) has been around for a decade now. It is always underfunded but gives county jails and state prisons some relief from the costs to house illegal aliens serving time in the US. So what I'm thinking is that those who wish to call their bailiwick a sanctuary should NOT be given SCAAP money. If you want it, you do Secure Communities. 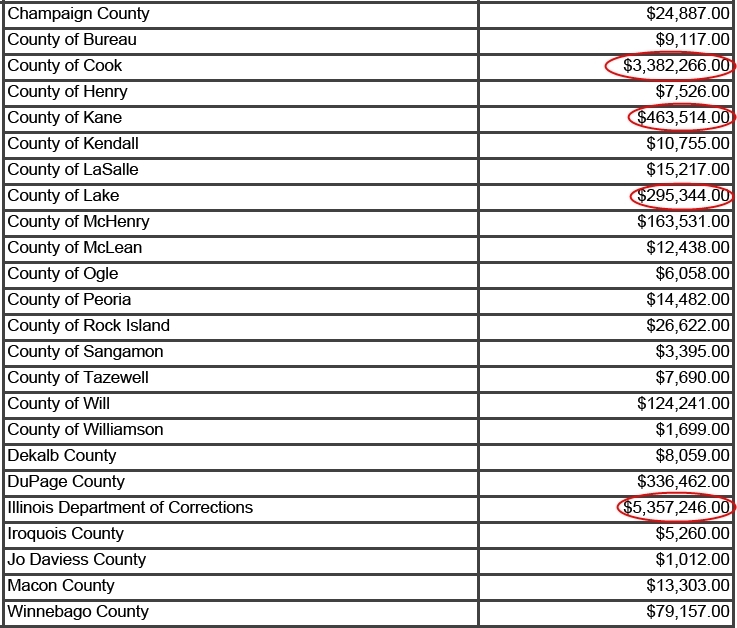 Looking at the money circled in red, that's $9.5 MILLION that ICE could use somewhere else. Take some of that cash and offer it to city jails in Illinois towns with a large immigrant population. The money would be spent for linking the fingerprint scanner to the ICE computer. And take some of the money and staff a wing out at the Thomson Prison in western Illinois. That wing will serve as a detention facility for those on their way OUT of the United States after being arrested for local violations of the law and identified as being here illegally. No new money spent and we are not rewarding bad political behavior.